Aaron started playing youth cricket at Dereham, featuring in the County set-up (in the same age group as Olly Phoenix) and appearing in the national final against Kent, taking the first 2 wickets in the game. Having progressed into Dereham’s 3rd team and then A Team in his early teens Aaron left Dereham to play for Great Witchingham, aged 15. His first season was in their A Team before playing for their 1st eleven in the Alliance Premier Division for a number of seasons. A return to Dereham (Div 3) followed as Aaron opted to play with his brother and the other players he had grown up with but, after a couple of seasons he was tempted by the prospect of Division 1 cricket at Mattishall. 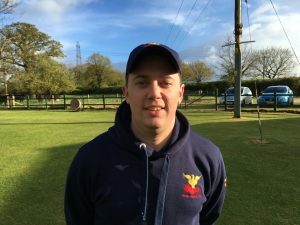 He played at Mattishall in Division 1 for 7 years but, having not enjoyed his cricket in 2015-16 and, knowing how much Tom Grant had enjoyed his move to Melton, Aaron played in our Patron’s V Legend’s game in 2016 before making the decision to join Great Melton in 2017. An off-spinner with best figures of 7-35 and a good high to middle order batsmen with a solid technique, Aaron looks an excellent addition to the club. He has a top score of 98 (runout!) so we hope his first century will be as a Great Melton player. Aaron lives in Costessey and works in Norwich as a Business Intelligence Developer.